CompleteGest® 40+ Renew / 60 Veg Caps - Nature's Way®. Because digestive enzymes naturally decline with age. After your thirties, you may not be able to break down foods the way you used to. Plus, digesting foods with wheat and dairy can cause additional concerns. 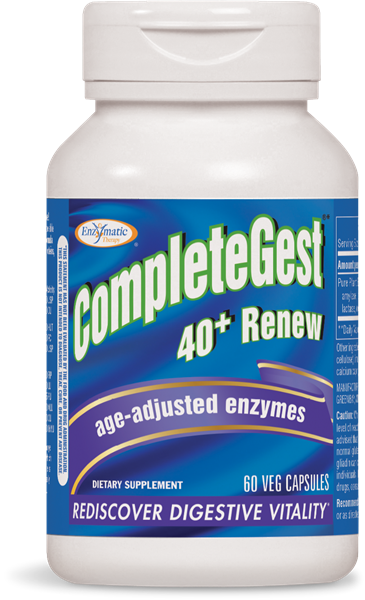 Why take CompleteGest®* 40+ Renew? Caution: While CompleteGest®* 40+ Renew will reduce the level of reactive gliadin and gluten proteins in a meal, it is advised that celiac disease sufferers continue with their normal gluten exclusion diet as even small amounts of gliadin can cause adverse reactions in the most sensitized individuals. If pregnant, nursing, or taking prescription drugs, consult your healthcare practitioner prior to use. cellulose, vegetable capsule (modified cellulose), inulin (from chicory root), silicon dioxide, and calcium caprylate.